You welcome an occasional cloudy day because it gives you a good WOO to take pictures in your garden. Bonus points if you’ve stood over a plant to cast a shadow on it because that provided better lighting than the direct sun that was shining on it. 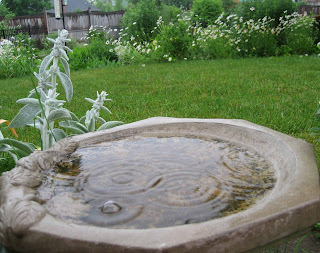 You go out in the rain to take pictures of the garden when it is all wet. You didn’t realize your camera had a red-eye reduction feature to take the red eyes out of human and animal subjects because you rarely take pictures of humans and animals. 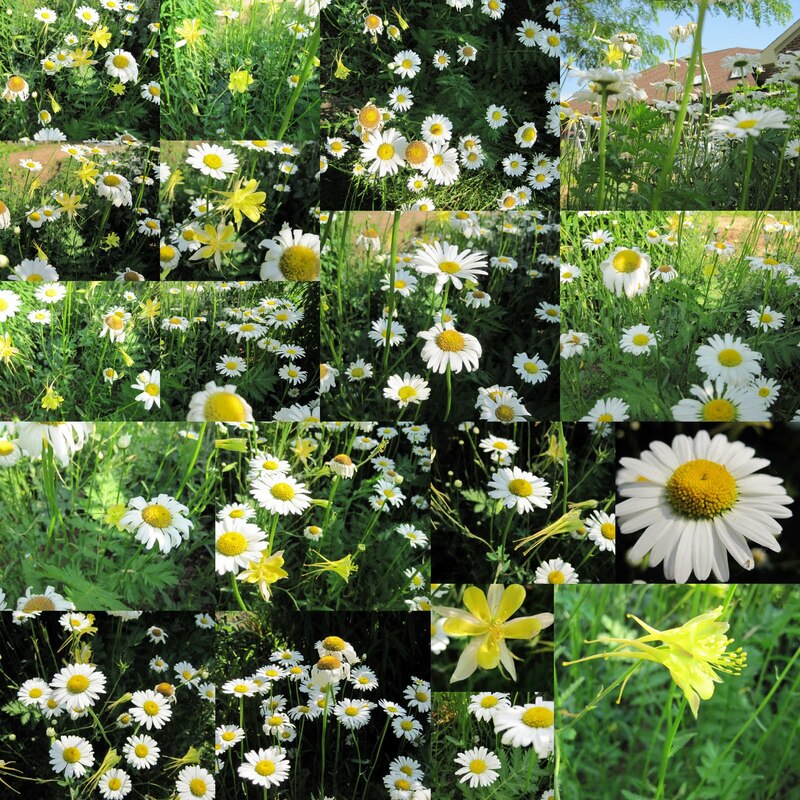 You take more than a dozen pictures of the same flower because from one second to the next the lighting changes, the wind blows differently, or you’ve thought of a couple more angles to take the picture from. You read about David Perry’s “macro in a mason jar” photography tip and tried it with plants. You show your vacation pictures to friends and they ask if you always vacation alone because there are no pictures of family or friends, just plants and gardens. Bonus points if you show your vacation pictures to fellow gardening geeks and they ask “what is that plant that is partially hidden behind your spouse/child/friend in the picture” and wonder why you couldn’t get them to move out of the way. You generally always take a camera with you when you are working in your garden so you can take pictures that would be otherwise “lost forever” if you didn’t have your camera with you right then. 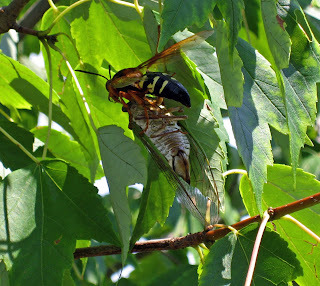 Bonus points if you shared the picture with an entomologist because you thought it was kind of cool, like this picture of a cicada killing wasp actually attacking a cicada in mid-air. You are a regular participant in Gardening Gone Wild’s monthly “Picture This Photo Contest”. Bonus points if you’ve won an award. Double bonus points if you’ve entered every month. If you answered yes to most of these questions, you really ought to consider entering Horticulture magazine’s garden photography contest. One grand Prize winner will be selected by renowned photographer Rob Cardillo; the winner receives $1,000 and the winner's name and winning photograph will be published in the January 2011 issue. Bonus points if you think you would use the $1,000 to buy another camera. Deadline is June 1, 2010 so more bonus points if you now hope that Memorial Day weekend will have perfect garden photography weather. Finally, you might be a photographing gardening geek if you’ve ever stood up on a ladder to get an overhead shot of your garden to show how the new beds are shaping up in the back yard. I remember reading the first garden geek list you posted and thinking I'll never be one of those people who is all of the things on the list. Well here we are years later and once again I do most of these things. Thanks for the giggle on such a hot day, Carol. Well, I'm definitely a Garden-Photo-Geek. Points #1 and 2...too true. Point #4...I can't figure out why non-Garden-Photo-Geeks don't get why I take 20 pictures of the same plant. They really don't get it. So glad to find I'm not the only geek out there. BTW, great shot of that cicada killer!!! Lucky thing you had that camera with you! I shot one last year sans cicada and thought it was the coolest thing. I visited the Alamo when I was in high school and took pictures of the plants. Ditto London. I haven't done them all, but I've done a good many of them. I do believe I see your lawn taking shape. That photo of the cicada killer is marvelous. The new beds are looking good. OK, you made me go and count. In the last year, I've taken 1745 photos, and roughly 1100 (that's 63%!) were garden or plant-related. Of the remainder, about 150 were wildlife/nature (but not plants), 50 were home improvement-related, about 200 had people in them, and the rest (~250) were other random things. And yes, this time period included two weddings and two vacations! This is exactly me. I keep a point and shoot with me at all times so I can photograph anything garden related no matter where it is. I like that shot from the ladder! I am about 90% gardening geek when it comes to photography. Carol -- this is too dangerous! I laughed out loud as I read your post! (now my FAMILY thinks I'm as nutty as the neighbors!) The contortions I go through to get those 'macro' shots.. it looks like an sad attempt to do 'downward facing dog', rather than taking a photo! Guilty, guilty, and GUILTY! I've even crawled up on the roof to get an overall pic of Max's Garden. And yes, I've sent a pic to an entomologist. You can find two of them of the Snowberry Clearwing here. I also have a couple of places to hang my camera when I take it with me to the garden. 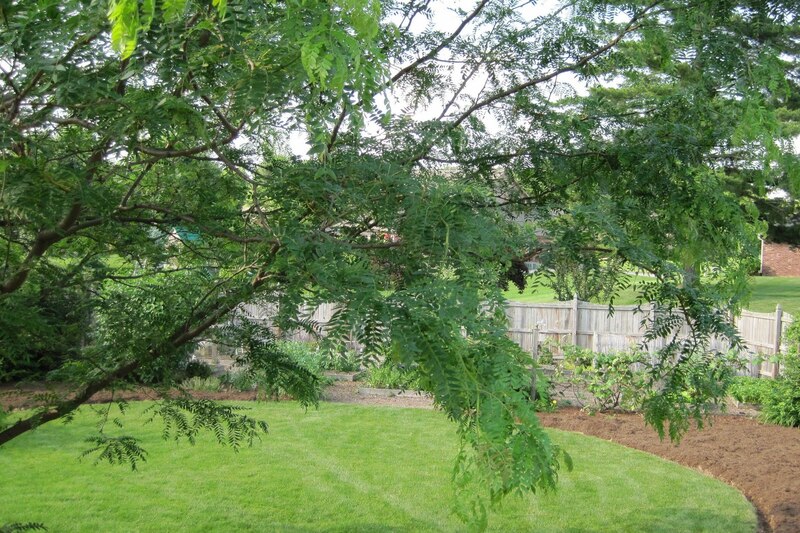 When I pruned a couple of trees, I left a little more of the branch so I could hang the camera there! Do I get any points for filling up the hard drive on my laptop with photos so that I had to buy an external portable hard drive JUST for my pictures?